Home > Ask Our Experts > My Pet Fish is 20 Years Old is this a Record? I have a Kissing Gourami pet fish Helostoma temminkii it is 20 yrs old! yes 20! I gave him to my Mum and she has since passed away so I care for him and have him - he is great and still spry. I was thinking to get him listed in the Guiness World Book of Records but I have no official proof of his age of course. How do you suggest I proceed? Although the average lifespan of kissing gourami kept in captivity is just five to seven years, it's not unheard of for well cared for individuals to reach their mid teens. Still, twenty is pretty impressive! You might have a record holder there. You can certainly be proud of your fish and of your skills as an aquarist. Unfortunately there is no established way to determine the age of a gourami. The ear bones of some fish grow in rings (rather like those in trees) that can be counted to establish how long they've lived, and it's possible this technique could be applied to a gourami, but, sadly, only after it was dead. If you want to apply to the Guinness Book of Records for recognition of your fish, your best bet would be to find witnesses who can testify to how long he's been around. This may mean that not all the years he's lived can be formally recognised, but he might still break the record. Ask friends and family members if they can remember when you first got him. There are two reasons why gourami don't usually live this long. The first is that inbreeding has reduced the hardiness of some domestic strains. The second is that people don't give them enough room. 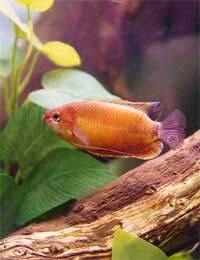 Kept in a small tank, a gourami will stay small, which is often more convenient for an aquarist wanting to keep a community of fish. However if it is given a larger tank and permitted to grow to its full adult size, the fish will be healthier and hardier and will last a lot longer. As you've probably discovered, a gourami given the chance to grow and given plenty of attention over a number of years can become a good companion. Gourami can have lots of personality which isn't always apparent when they're in shoals but which comes to the fore when they get to know their keepers. They're very rewarding fish to keep and to spend time with. Stress always shortens a fish's lifespan, so if your gourami is twenty years old then he must be enjoying living with you, too!